The Hillside Restoration Project began in 1998 as a joint venture between the Boylston Historical Society and Boylston�s municipal leaders. 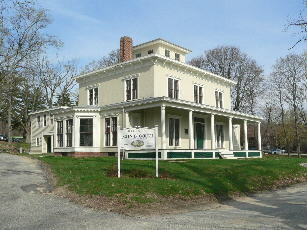 The acquisition of the property by the town gave impetus to a long-standing desire to save, rehabilitate and reuse the estate of the internationally renowned 19th century social reformer, John B. Gough, one of only seven National Historic Landmarks in Worcester County. Today, an independent Board of Directors manages the Hillside Project. The primary goal of the organization includes the full restoration and adaptive reuse of the Estate utilizing the highest possible standards befitting of a National Historic Landmark. The estate, which is architecturally and historically significant to the town, state and nation, will be utilized as a resource for educational and cultural programs, particularly youth programs in collaboration with the Worcester County school systems. The organization also plans to facilitate the use of the unique architectural and landscape features of Hillside for study and research. While continuing to preserve and promote its many historical, architectural and cultural assets, the Estate will be managed as a self-sustaining, multi-use facility. Boylston, MA. Sixteen windows from the historic John B. Gough Estate at Hillside were removed for restoration last Thursday, January 25 by craftsmen from Window Master, a historic window restoration company in Dublin, New Hampshire. In addition the company will also repair and replace a sill at the Cupola of the house. After receiving a grant from the Fuller Foundation, the Hillside Restoration Project�s building committee decided what windows would be restored based on location, level of deterioration and budget considerations. �The committee felt the windows in the front section of the house were a priority as they are the most visible and are an important aspect of the historically-sensitive restoration. This window project is in keeping with our plans to bring the front section of the estate back to it�s original mid 1800�s period,� said Patrick Healy, member of the Hillside building committee. The windows that will be restored are located in the library octagon, dining room, breakfast room, kitchen on the first floor, as well as nine windows in the second floor bedrooms. The project is scheduled for completion within six weeks. The Hillside Restoration Project, Inc. (HRP) is a private, non-profit organization whose mission includes the restoration, preservation and adaptive reuse of the John B. Gough Estate, �Hillside�, in Boylston, one of seven National Historic Landmarks in Central Massachusetts. The project is one of the most comprehensive historic preservation efforts in the region and has been recognized by local, state, and national preservation organizations. The HRP strives to form mutually beneficial collaborations and partnerships with educational, cultural, and civic groups in the preservation of this historic landmark. 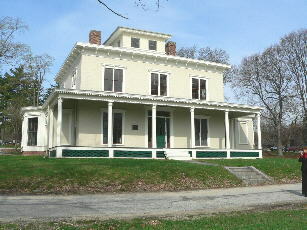 The mission of the Hillside Restoration Project is to restore and preserve the Hillside Estate, home of the internationally renowned temperance orator and social reformer, John B. Gough, to serve the community as a center devoted to the study and interpretation of America's nineteenth reform movements.